Do you have a special moment's, when time stood still for you? Maybe the day you got married or the birth of a child. This gorgeous necklace would make a lovely gift to give to your partner to celebrate the birth of a child or to cherish the day and time you got married or maybe to remember that first date. 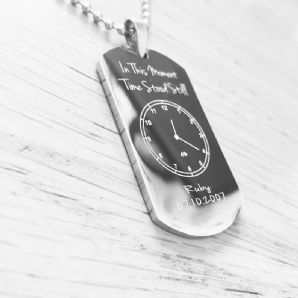 We will engrave your chosen time, date and name onto one of our gorgeous shiny stainless steel tags. As an added bonus we will also engrave the message of your choice onto the rear. * Presented in a gift box.